Arivale: Gut Check (and More)! The Seattle startup Arivale wants to make you feel better, but don’t call it a health care business. 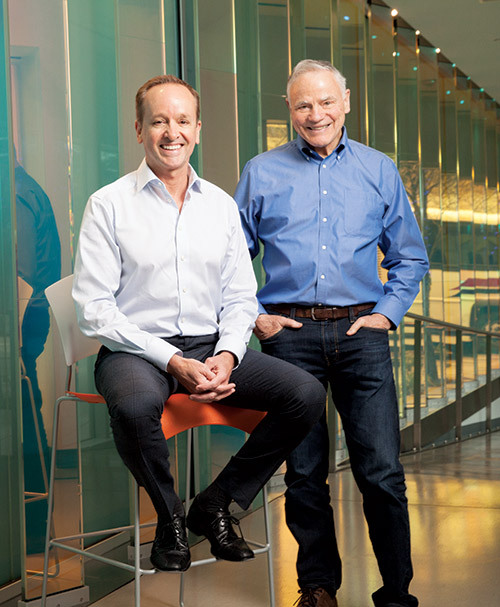 CEO and cofounder Clayton Lewis, a board member of Harborview Medical Center and a former venture capitalist, says Arivale sells wellness, a category distinctly different from health care. For $4,000 a year, customers get recommendations on how to optimize their health based on a thorough review of their genetics, gut microbes, lab values for blood and saliva and activity tracking. They also get monthly coaching from nutritionists on how best to follow through on those recommendations. That annual fee would not bring a strong enough return to justify the tens of millions of dollars venture capitalists have invested in the company. Lewis says only that Arivale isn’t in business for a quick profit and won’t reveal its long-term profitability strategy. Most likely, profits will come from collecting, analyzing and repurposing data — the information and insights Arivale gains from its own customers. People who sign up are encouraged to grant permission for their information — with identities removed — to be shared. Prominent Seattle techies have been among the early adopters and have become big proponents of the service. Lewis himself improved his triathlon performance by understanding his nutrition, based on information from his genetic profile. Ed Lazowska, computer science professor at the University of Washington, learned he had elevated levels of mercury in his blood. His Arivale coach suggested it was because of the tuna sushi he was eating three times a week. Once Lazowska replaced the tuna with salmon, his blood-level mercury dropped. Arivale was cofounded by Leroy Hood, M.D., Ph.D., founder of the Institute for Systems Biology (ISB) and co-inventor of one of the first sequencers to plot the human genome. Hood also launched or helped to launch 15 biotech companies, including Amgen and Applied Biosystems. Arivale opened last July with a round of investment totaling about $39 million, including funds from Arch Venture Partners, Polaris Partners and Maveron. Arch and Polaris are known for their expertise in health and life sciences; Maveron is recognized more for consumer-focused businesses. Arivale has about 80 employees now and intends to expand to California and grow to about 250 employees and 10,000 clients — Arivale calls them pioneers — by the end of 2016. Although Arivale has initially focused on individual customers, Lewis says the ultimate goal is to persuade self-insured businesses to sign up so they can offer the service to employees. In February, Arivale announced that the Sabey Corporation was enrolling its 110 employees in a pilot project. (CEO Dave Sabey is board chair at ISB.) At least three other businesses are considering the service. The role of the dietitian-nutritionist coach constitutes an important element of the Arivale approach. To lead that practice, Lewis hired Jennifer Lovejoy as chief translational science officer. She has years of experience at Alere Wellbeing, a company that provided smoking-cessation coaching and other behavior-change services. She was responsible for implementing programs for wellness, weight management and cessation of tobacco use. At Arivale, once a client undergoes the test, a panel of doctors and researchers looks at the results and comes up with three essential recommendations the client should focus on. The individual then has a monthly telephone call with a coach, who helps the client plan ways to carry out the recommendations. In addition to the monthly calls, clients can also communicate with their coaches through more frequent emails or texts. Arivale has its skeptics, many of whom point out that much of the advice Arivale offers, such as getting more exercise and eating more fruits and vegetables, does not require special testing. Shannon Brownlee, author of the book Overtreated: Why Too Much Medicine Is Making Us Sicker and Poorer, calls what Arivale does “ultracompetitive navel gazing” for Baby Boomers. Brownlee, who is SVP of the Lown Institute, a nonprofit outside Boston dedicated to improving public health, questions whether any recommendation on nutrition based on an individual’s gut bacteria has enough evidence behind it to be proven effective. Arivale also has plenty of competition. Craig Venter, a pioneer of genome sequencing, offers a wellness product at Human Longevity Inc. that costs $25,000. Longevity’s Health Nucleus program incorporates the genomics and gut microbiome testing with the whole-body imaging of an MRI. Another competitor, Newtopia, is a stripped-down model from Aetna that performs less complete testing on and provides coaching for people at risk for metabolic syndrome. Results of a 500-person study published late last year showed half the workers stuck with the program beyond a year. Newtopia costs about $500 per person. Its goal is to save employers money on future health issues for their covered employees. In January, the publication PharmaLive ranked Arivale sixth among its top 20 life-science startups to watch. And of the 100 or so people who joined in an early pilot project, many say Arivale’s tests provided valuable information and that the coaching services were helpful. Tayloe Washburn, founding dean of Northeastern University–Seattle and now a consultant to the university, found out in the pilot study that he had a genetic mutation that causes a treatable condition known as hemochromatosis, which makes the body fail to store iron correctly. Washburn shared the information with his own doctor and received treatment for the condition. California physician Molly Maloof raves about her Arivale experience. She writes in an email that, as a practicing physician, she doesn’t always take time to care for herself. As a result of her Arivale tests, she found out she was anemic, and has started taking iron. She also learned she had a higher risk of arthritis and is trying to take nutritional steps to address that condition. “This company is a forerunner in enabling people to safely improve their health using data-driven, personalized wellness interventions,” says Maloof. One important goal at Arivale is to collect data that provides new insight into how the body works. Others in the genomic space, such as 23andMe, have collected from their customers information that later became valuable, such as outlining a new direction for a particular therapy. Arivale is going further by gathering billions of genomic, microbial and blood data points, along with information on such things as diet, exercise and sleep patterns. In-depth data from tens of thousands of individuals, combined with the computational biology expertise of Arivale’s sister organization, ISB, could put Arivale in an excellent position to develop unique insights. “Genomics by itself is one-dimensional,” says Hood. “But with these other things [such as microbiome and blood tests] … it’s dynamite.” If a person has elevated blood levels of a particular cardiovascular risk marker in spite of a diet high in B vitamins, for example, knowing that the person has a genetic variant that interferes with the body’s ability to absorb those vitamins would lead the Arivale coach to recommend a different approach to addressing the issue. After working with data from just a couple of hundred people, Arivale has discovered more than 10,000 correlations not before recognized. Over time, these correlations could help Arivale better guide recommendations on how to improve individual wellness.